Keto! Gluten Free! GMO Free! IKDiet Phase Two Approved! Helps Curb Appetite! Assists with Weight Management! Keto. Gluten Free. GMO Free. IKDiet Phase Two Approved. Helps Curb Appetite. Assists with Weight Management. Improves Muscle Strength. Helps with Overall Health & sense of Well-Being. No Preservatives. Gluten Free/GMO Free/Soy Free/Whey Free. Derived from USDA Certified Organic Eggs sourced from cage free hens at GMO-free egg farms. 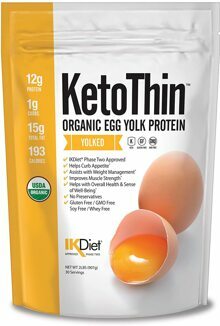 This product has the perfect 3:1 fat to protein ratio (by calories) prescribed by the popular IKDiet – available free online at IKDiet.com. Our low-carb, high-protein, easy-to-digest formula can help you reach or maintain your wellness and weight loss goals. Ideal for nutritional beverages, bars, cooking and baking. 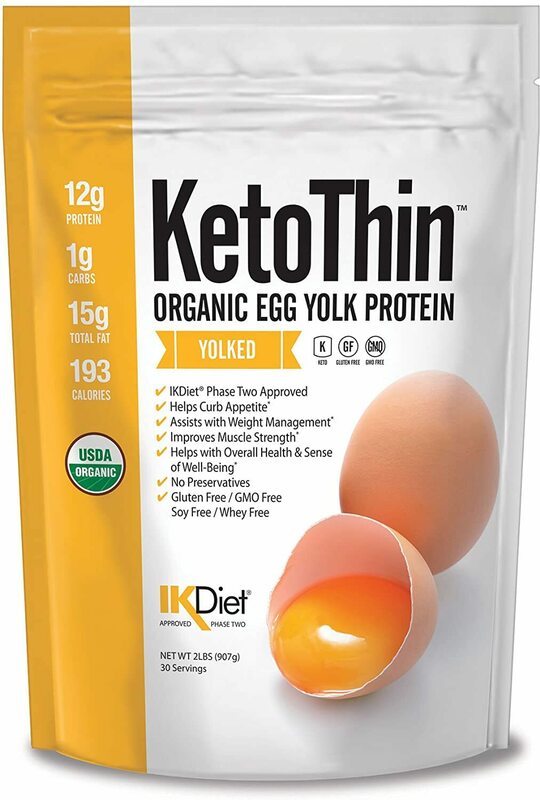 KetoThin Egg Yolk powder is easily blended with organic stevia or monk fruit for extra sweetness. Turn Your Body into a Fat Burning Machine! The ketogenic (keto) diet has become extremely popular in recent years as both science and practice have proven its effectiveness in helping people lose weight. Studies have also shown that people who implement a keto diet also experience improvements in cholesterol levels, triglycerides and blood glucose levels. Each of these are characteristics linked with decreased risk of heart disease and associated health problems. The keto diet is essentially a high-fat, low-carb, low-protein approach that, after a period of time, puts the body into a state of ketosis. Ketosis is a condition in which the body does not have adequate glucose for energy and then must turn to fat store to maintain physiological function. The result is accelerated fat loss.